There are some places a car just can't go. Typically Google has turned to pure manpower to get these locales Street Viewed, but for the deep desert it seems that wasn't good enough. 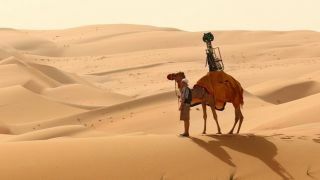 Thus the search giant did the obvious and strapped its Trekker camera to a camel named Raffi to capture 360-degree images in Abu Dhabi's Liwa Oasis, reports The National. We're calling this technique the "camelra" from here on out. Google spokesperson Monic Baz told the site that the company hired Raffia "so that it can capture imagery in the best, most authentic and least damaging way." Plus we doubt anyone is going to complain about Google collecting too much user data out in the Sahara. Google doesn't need a camel to capture more of TechRadar's blips.